“Das Zunfthaus zur Zimmerleuten“, in Zurich has been freshly renovated and reopened in October 2010. A fire back in 2007 gutted a large part of the building on the first floor along with the party hall. The water used for extinguishing the fire also however left noticeable traces, particularly in the rooms beneath this historic building, where the gas heating system was also affected, leaving it badly damaged and having to be replaced. The newly restored splendour of the building also includes high degree of comfort. This is ensured by a new, modern heating system from ELCO. 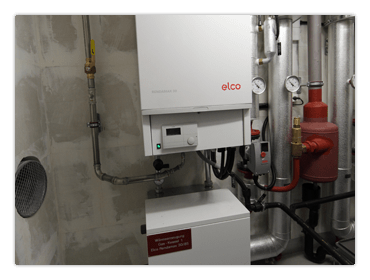 Two wall-mounted R30 gas condensing boilers (each with 85 kW output) have been installed. This heating system is very fuel-efficient and excels with its low energy consumption and low pollutant emissions. As such, for the entire installations, it is possible to save up to 25 % energy compared with the old system.